The entire Rocky Mountain National Park is too large to save. We love Google Maps on our Android smartphones. The only problem is that the maps come from the Internet. So, if our phones are out of range of Verizon Internet Access, then we don’t have a map! It happens to us very seldom, but for the last couple of weeks we’ve been in Colorado – driving into the Rocky Mountains. There comes a point where your phone reports that it has NO data access, and you will not be able to see a map using Google maps. It’s kind of funny actually, the satellite-based GPS signal is still good – so you have a little blue arrow representing your position as a latitude and longitude. The problem is, with no map, your blue marker is just swimming on a white screen. You’ll probably see a message “Area too large, zoom in.” When you’ve zoomed in far enough the message will go away and you’ll have the option to SAVE. When you have the map selected that you want to be available offline, touch ‘Save’ at the bottom. In the picture above, I was trying to select the entire area of Rocky Mountain National Park. It seemed to be pushing the limits of the area allowed. The size restrictions have not changed as far as I can tell. In order to use the saved map you need to retrieve it. Do that by tapping the person icon in the upper right , then scroll down until you see “Offline Maps.” There you’ll see a list of all the places you’ve saved so you can select the one you want. People in the shuttle bus were amazed to see me consulting my smartphone at 10,000 feet! 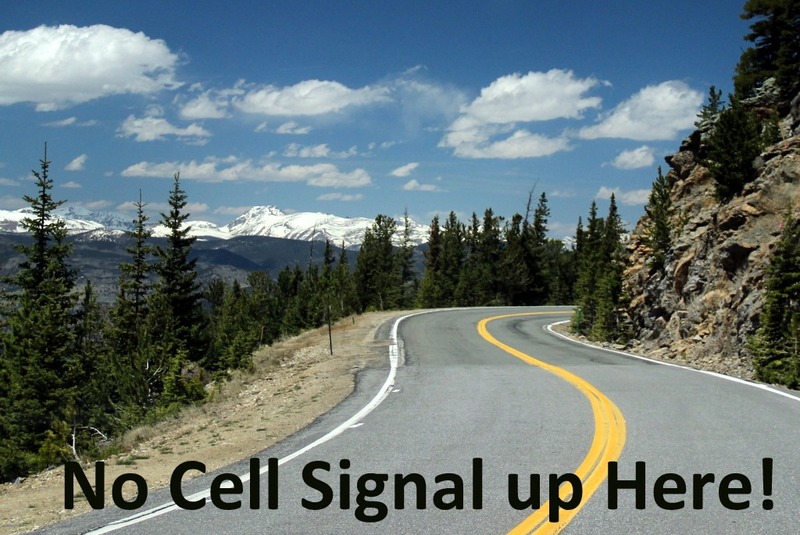 “You have cell signal up here?” they exclaimed. “No,” I replied, “I’m looking at the map I downloaded before we started out today.” And, when we completed the shuttle bus tour and returned to our car, we had all the maps we needed on our Google Navigation to guide us to a short hike at Copeland Falls in another area of the park. This does not work for large areas. 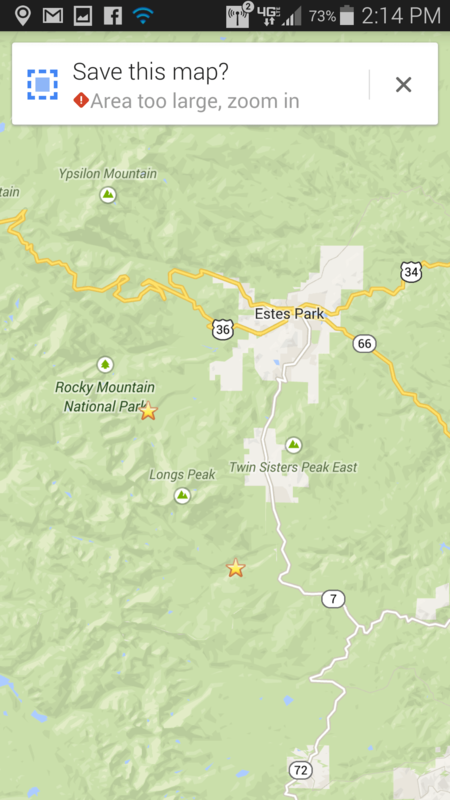 I think a map the size of Rocky Mountain National Park is about the maximum you can cache. Don’t plan to make a map of Colorado and Utah available offline. However, it has been our experience that, if you start Google Navigation in Denver, and plan your destination somewhere in Utah, you will see the road you’re on as it navigates even thru territory with no cell signal and no map. You only see the road that was planned for the navigation with no info on your surroundings. 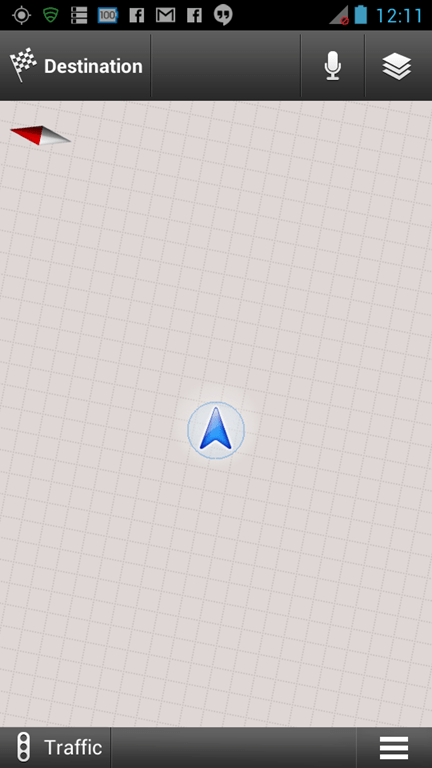 If you use a dashboard style GPS device, they have all the maps built into the device. We also recommend a Navigation app called Co-Pilot Live for Android, and Apple mobile devices because it downloads all the maps to the device. But, if you love Google Maps like we do, and want to occasionally use it in areas with no cellular service – just download the maps before you lose the service and they’ll be there when you need them. Published by MrsGeek, in Blog. Tagged with google maps offline. “Done” button is not available, with no error information within the latest Maps update, while the estimated data size seems fine. This UI shocker is the latest in the whole Google Maps offline disaster. It’s never worked reliably for Europe, where data roaming issues and requiring offline map data go hand in hand. Bob, I’m afraid it’s only on android right now.